Emile Henry + Gilt Groupe = Classy Not Pricey! This is where things got serious for my mission to stay classy (hello beautiful bakeware!) but not pricey. That last part was going to be a real challenge if I wasn't extremely diligent and careful about my buying process. Price: $25. Dimensions: 8x8. Warranty - none specified. Oven safe up to ? degrees, but also freezer safe. Decently good looking. Matching items: plenty. Mental note made. I then researched the highest end of the spectrum, wanting to understand the reason for the differences in price and what I may be up against in acquiring a complete set. Any discerning brand lover for kitchen items knows Le Creuset is one of the coveted creme-dela-creme options, so I happily switched to perusing Le Creuset online and found a comparable dish here. Price: $40. Dimensions: 8.5x8.5. Warranty: Limited 5 Year. Temperature handing: Unmatched -65ºF to 500ºF. Temptingly good looking. Matching items: Nearly dangerous numbers. French. Mental note #2. Price: $45. Dimensions: 8.5 x 8.5. Warranty: 10 Year Guarantee. Temperature handing: -0ºF to 500ºF. Red inside (meaning less potential for staining). Matching items: Same as Le Creuset. Equally French. 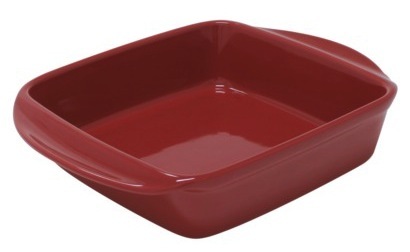 The price on this item was a little stunning to me, seeing it was more expensive than the Le Creuset equivalent. When I looked further, the unbeatable warranty and the heat conduction/retention of the clay used in construction were both unmatched, and I liked the modern look of the design and matching pieces. So my "watchlist for kitchen deals" were focused on Le Creuset or Emile Henry. After all, I would probably keep my purchases for a long time, and saw the quality worth the investment if the right discount came along. 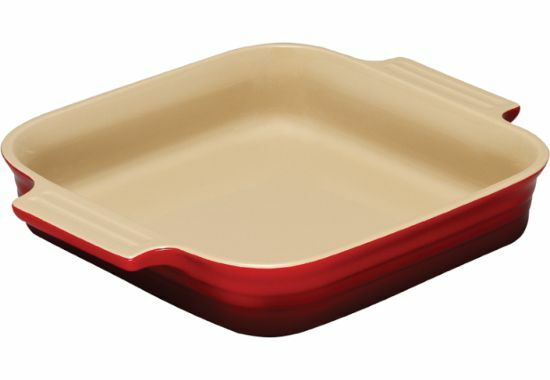 For two pie pans, two loaf pans, two square dishes, and a large salad bowl (also bakeware), the retail prices as quoted on the Emile Henry Website (and compared across the web) would have totalled $290. Through Gilt's sale I paid only $140! That's a savings of $150, or nearly 52%! And to round out the collection, I purchased the Emile Henry Roaster at Bed Bath and Beyond with a 20% of coupon for $45 less than the retail price, giving me a full set of bakeware (the roaster is also for lasagnas... yes, my husband eats THAT MUCH) for the same price that I would have spent at Target for a set of far lesser quality. Moral of the story - research your brands, compare for durability, look at the value of a solid warranty, and wait patiently for the right moment to buy. That's my story, and I'm so proud to stick to it as I put away my amazingly classy and not (for me) pricey finds. Cheers!